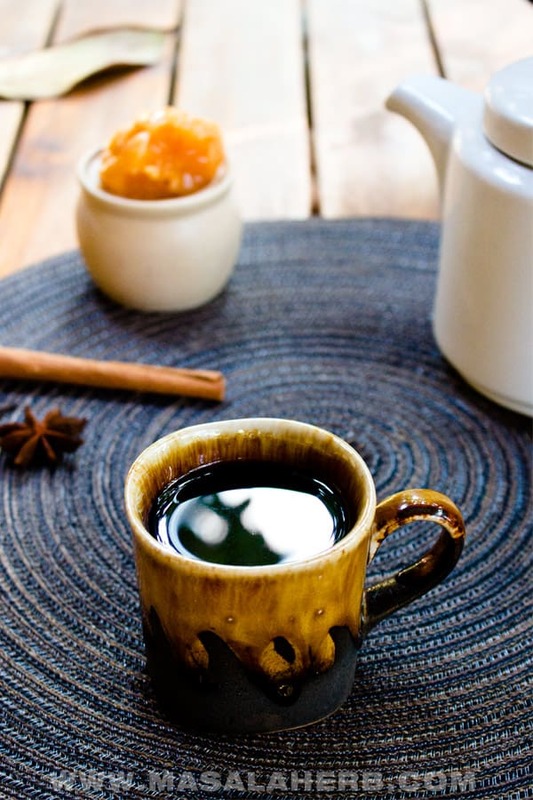 Cafe de Olla is a spiced black filter coffee sweetened with palm sugar, popularized in Mexico. The spices enhance the coffee in such a way that your cold bones are warmed up instantly! That’s why Cafe de Olla is a favorite during cold winter days. And to our luck, it’s crazy easy to prepare Cafe de Olla from A-Z! I have put together a video for you so that you can see how it’s done. Cafe de Olla means literally translated, from Spanish, coffee pot (pronunciation). It was the year 2007, a lengthy train ride and 5 unusual people from all around the world traveling in the same passenger coach across the Indian subcontinent. Yes, I wish I could have told you a Mexican desperado story, but faith had a different idea in mind to bring me closer to Cafe de Olla. Then the unusual, 40 something guy who lived in San Fransisco but was apparently from the royal Taiwanese family (can you see me pulling my eye down?) and who was continuously broke waving about his 5 credit and debit cards. The young German with a beard like Tom Hanks in Castaway, a nagging attitude, owning self-centered point of views. And finally the two Mexicans, a young couple, both long dark hair, yoga trained bodies and a positive inspiring mindset. As you can see, it is always vital to think about how you appear to others, people like me never forget! In those extra 12 hours we traveled through the night, it was bitingly cold in the train. Whenever the train would stop at a station, you would have these boys selling hot spiced chai and sometimes Nescafe. The Mexicans were not religious about a particular food trend, they were vegetarian but they would allow themselves to have tea and coffee. So the Mexican girl, whose name I can’t recall, was bitterly freezing. You see, practicing yoga doesn’t mean you know how to control your thermal energies (can you see me pulling down my other eye this time?) and she hadn’t collected body fats for the winter. Nor did I! We were both freezing while the royal Taiwanese guy from San Francisco was jumping around from left to right because he was hyperactive and couldn’t sit still, not even in his 40s. At that same very moment a boy was passing with spiced tea and Nescafe and he didn’t have these throwaway paper cups, no he was using small throw away, more Eco-friendly, clay pots. When my newly found Mexican friends saw this they got excited and started to share their love for Cafe de Olla, which is Mexican national hot spiced coffee beverage. So the Mexican guy, whose name I just can’t remember, got for each of us one coffee and one chai and he started to mix around (he bought from the boy another empty clay pot) and created for us what could have never been a cafe de olla. The palm sugar was missing! However, it came close enough to it! After the train ride we parted from each other, however I never forgot this famous cafe de olla and decided to make it for myself later on. What is Caffee de Olla? 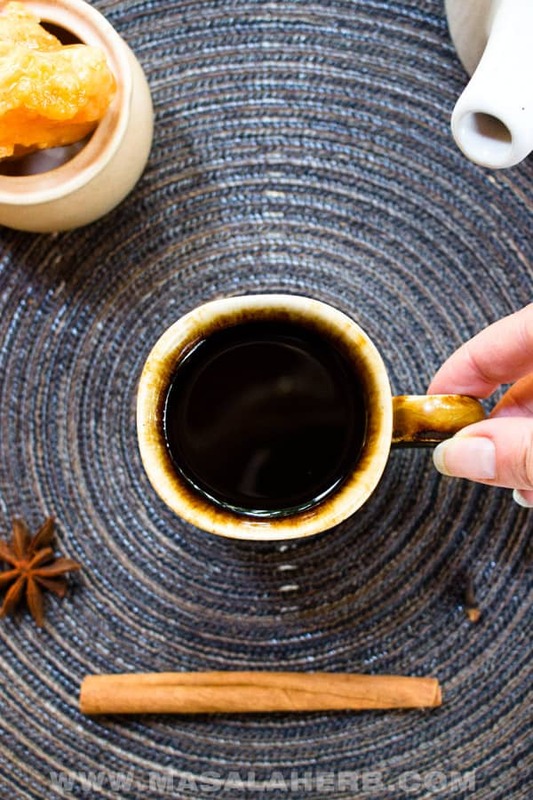 This particular Black Coffee is a traditional Mexican hot spiced beverage sweetened with whole sugar cane. The Mexican sugar cane cone or blocks are known as Piloncillo and come in different shapes, just like the Asian and African Jaggery, the Brazilian Rapadura or the Columbian Panela. Sugar cane lends the Café de Olla a certain strong sweet and earthen addictive flavor. It’s like going to the third world store in Europe and testing new coffee variations. De Olla literally means Earthenware/clay pot! Cooking the coffee from scratch in clay pots gives it de olla effect I suppose. I don’t know as I have honestly not tried it, but I can imagine that the minerals of the clay pot must be giving something special to the coffee beverage. Alone the fact that the naked flame is touching the clay pot underneath and cooking the coffee must be a reason to believe that the flavors will be more intense and exciting. For all those of us who live in the 21st century, we still have the option of using a regular pot and stove to prepare our own cup of hot cafe de olla. Something more common anyway these days is to prepare cafe de olla in a regular pot and a regular gas stove and then fill earthen cups with the magical hot beverage. You serve it that way then and in that sense, you can still call it a cafe de olla! How do you make Cafe de Olla? Cafe de Olla is easily prepared at home. In fact, you could make it every day if you wanted. It’s just not your usual flow of preparing coffee. For example, I have my coffee filter machine and I just need to pour water in, place the filter into the coffee maker and fill the filter with ground black coffee and switch on the machine. That’s it! Making Cafe de olla is not more complicated, it just requires you to cook it in a pot. So that means you will need to wash a pot, that’s it! No more extra work! So, while the traditional Cafe de olla, as the name suggests it, is prepared in an earthenware/clay pot over an open fire, we will be skipping this as I don’t own a clay pot and I bet you don’t own a clay pot either, right? However, we will stay true to the name by serving the wonderfully delicious hot spiced Mexican coffee in clay cups! You keep your pot on the fire with the water. Heat up the content while you start adding the sugar cane. Sugar cane, and that includes jaggery, piloncillo, panela and rapadura, comes in stone hard blocks or cones. So the smart thing would be to buy the one, which comes in small cones or smaller chunks and pieces. The more rural you go the bigger the cane blocks and the cheaper you can buy the sugar cane. Besides, sugar cane blocks come in different color shades! The Mexican Piloncillo is usually dark brown. In Asia, for example, you get from yellow to dark brown sugar cane cones and blocks. In fact you also get coconut jaggery and palm jaggery. Coconut sugar is usually more dark brown. The quality of the sugar block depends on the region and the way it was made. You can experiment to see how the natural unprocessed sugar is turning your cafe de olla into a different flavor experience each time. How do you cut jaggery/piloncillo/sugar cane cones and blocks? The easiest way is to place the sugar cane cone or block into a vacuum bag. Then place it on a kitchen surface and grab a meat smasher. I just smash the sh** of my sugar cane and that is the fastest and least messy way to handle sugar cane blocks and cones. Of course, you could also try scraping off and cutting off, but I think the vacuum bag method is more efficient. You need to add the sugar cane pieces into the cooking water. Briefly mix the chunks into the water. The rest will dissolve gradually while it’s cooking. Then add your spices, cinnamon stick, 1-star anise and 1 clove (more than enough!) and of course, we need our coffee too so just add in the ground coffee, one spoon at the time. Just mix the content and bring it to a boil. Afterward, keep on low heat for 5 minutes. I found the easiest way to filter the spiced Mexican coffee is to use a coffee filter placed into the filter coffee machine. Then just pour the coffee into the filter, one batch at a time so that it gets filtered and you have the clean coffee dripping into the coffee jar. To serve just briefly heat up again, that’s it! Of course, you will need to enjoy the cafe de olla in a clay cup such as the one below. Café de Olla is prepared with sugar cane and spices. The name de olla means the coffee is served in earthenware/pottery. Cafe de Olla is a Mexican traditional hot non-alcoholic beverage which is prepared during the cold days in winter. It warms you up from within! This cafe de olla is on the sweeter side so you can choose to reduce the sugar cane amount to make it less sweet. If you are used to sweet tea or coffee, then this recipe will be sweet enough for you. Keep a pot with the water to cook and add the sugar cane (Jaggery/Piloncillo). Mix the sugar caner into the water, it won't dissolve directly but gradually while the coffee is cooking. Continue to add in the spices: cinnamon stick, star anise, and clove. Make sure at this point that the water is cooking. Then add the black coffee and mix into the liquid. Bring to a boil and let cook for about 5 minutes on slow heat. At the end, we need to filter the coffee because of the fine ground coffee sediments and sometimes the sugar cane can have impurities (that is why I don't add the sugar cane while serving) and besides we need to pick out the spices. So, what you do is you get a regular coffee filter, don't use a strainer it won't work, and best is if you just place the coffee filter into a filter coffee machine and then just pour the cafe de olla into the filter gradually one batch at a time. The coffee will get filtered and drip slowly into the jar below as it would do with regular coffee in the machine. After you have filtered the coffee you can heat up your coffee again to serve hot. I use a stronger variety of coffee blend for this cafe de olla recipe. I choose peaberry, freshly roasted and finely ground and roasted coffee beans, but you can use something like Arabica too if you want your coffee a bit milder. 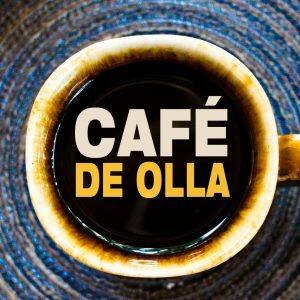 Dear Reader, How did you get to know about the Cafe de Olla? sounds like quite a train trip…and some tasty coffee! I didn’t know what Cafe de Olla was but once you said it involved Piloncillo, it sparked something! I think I’ve had this, never nice. I also loved your train story and how you were introduced to it! I loved your train story — well done. Now, that coffee would wake a person up. In fact, this is just the pick-me-up I need this morning. I’m saving the recipe. This sounds like delicious! I know you mentioned that no strainer but do you think a cheesecloth would work here? I have not tried it but it might just work out as well too. I am used to coffee filters because I know how long it would take for the coffee to drip into the jar below. I can’t say the same for a cheesecloth, however technically there is no reason why you can’t filter the café de olla with a cheesecloth. I’ll share this with my husband. He loves to get creative with his coffee and likes to find strong coffee. What an adventure! I had never heard of cafe de olla before and I wish I liked coffee because the spice combo sounds awesome! Wow, this is such an informative post, I’ve never had this kind of coffee but I can’t wait to try it! Oh I do have to make this! I love a spiced coffee and this one just looks amazing! I am fascinated by the story of your discovery of Cafe De Olla. The connections that we make when we something familiar is amazing like your friend remembered her coffee on seeing the small earthen pots or Kulhads as we call them. I am not sure how the tea mixed with coffee tasted except for the flavor lent by the kulhad. I remember I liked the roadside coffee in Indonesia that had a very textured feel on the tongue, was definitely made with some cane sugar and was thick – it tasted heavenly though. Your post brought back the fond childhood memories of my long train journeys. Hi, this may be interesting you: Cafe de Olla Recipe!